While SB 2664 passed the House of Representatives due to strong lobbying efforts by a coalition of proponents, including the Realtors, State Bar Association, Illinois Bankers Association, Community Bankers Association, and the Illinois Credit Union Association; CAI members and homeowners efforts in opposing the bill won 47 "nay" votes. Although this is not a true success by definition, it is an example of our potential when homeowners assemble with a single message and why every single call and email made is important. So far the Governor has received nearly 2,000 emails from concerned CAI members. We must continue to come together and ask Governor Quinn to veto this SB 2664. Why? Because the bill will create more problems and is a fee increase for homeowners in associations. 1. SB 2664 would prohibit condominium associations from including special assessments, chargebacks, and limit a condominium association's ability to collect late fees, attorney's fees or court costs, from third-party purchasers following a foreclosure. While these fees and costs may be collected, the total amount that can be collected may never exceed 9 months of regular assessments. The end results in most cases would have associations receiving less repayment than under the current statutory scheme. Less repayment means more fees for unit owners. 2. SB 2664 is incomplete legislation that impacts condominium associations by creating a new scheme for collecting under super lien rights, but it does nothing to impact townhome, homeowner or master associations. This bill would create a double standard forcing condos to play by one set of rules while all other community associations play by another. 3. SB 2664 is being passed without any recognition or understanding of its impact upon community associations and the overwhelming majority of owners who pay their assessments in a timely fashion. This bill seeks to protect a very small group of people: attorneys who represent buyers at a real estate closing. This bill is a detriment to all of our communities and could ultimately result in difficult decisions for boards in determining how to allocate their already limited resources, and would likely lead to increased assessments for the balance of the owners. The interests of community associations and the owners that live in those community associations have been completely ignored in SB 2664. 4. Finally, SB 2664 reduces the days an association (or its management company) has to respond to a request from a purchaser for information from 30 days to 14 days, if the association is managed. If the association is self-managed it has 21 days. This reduced time-frame creates an unnecessary burden on community association managers and homeowners that are already required to reply to purchaser requests in a timely fashion. Please contact Governor Quinn's office immediately and often and ask that he VETO SB 2664. Email his office by following this link or pasting this link (http://www.capwiz.com/advocacycenter/issues/alert/?alertid=63239886&type=SW) into your browser. It is VERY IMPORTANT that you and other members in your community act. Send this message to your community and ask that they too contact Governor Quinn and ask to veto SB 2664. The CAI Illinois LAC will update you on any action it receives. Thank you for protecting your community! Chicago International Film Festival Celebrates 50 Years! Celebrating 50 years of making Chicago an international destination for acclaimed filmmakers, bold new directors and lovers of cinema, the Chicago International Film Festival returns October 9 – 23, 2014. The anniversary celebration will kick off with an Opening Night Gala presentation at the Harris Theater (205 E. Randolph St.), followed by a Golden Anniversary celebration at the Chicago Cultural Center. All other Festival screenings will be held at the AMC River East 21 (322 E. Illinois St.) Programming and ticket information will be announced at a future date. On November 9, 1965, a 22-year-old Michael Kutza launched the Chicago International Film Festival at the Carnegie Theatre on Rush Street. A mere eight films competed in the feature category, but, even in its inaugural year, celebrated figures including King Vidor, Bette Davis and Stanley Kramer attended to support what would become North America’s oldest competitive international film festival. Fifty years later, the Festival has earned an international reputation for discovering groundbreaking directors, including Martin Scorsese, John Carpenter, Wim Wenders, Liv Ullmann, Peter Weir, Mike Leigh, Margarethe von Trotta, and Chicago’s own William Friedkin and Joe Swanberg, who are but a few of the hundreds of world-renowned filmmakers recognized early on in their careers by the Festival. One of the Festival’s most notable features is the vast diversity of offerings, with numerous competitive categories and several highlight programs such as Black Perspectives, Cinema of the Americas, ReelWomen, Out-Look, After Dark, and the City & State program, showcasing films made in Chicago and throughout Illinois. In 2014, the Festival will shine a spotlight on Scandinavian cinema. Cinema/Chicago is a not-for-profit arts and education organization dedicated to encouraging better understanding between cultures and to making a positive contribution to the art form of the moving image. The Chicago International Film Festival is one of the year-round programs presented by Cinema/Chicago, which also include the Chicago International Film Festival Television Awards CineYouth Festival, INTERCOM Competition, International Screenings Program, and Education Outreach. Perillo Auto Group is proud to sponsor the Chicago Police Department Memorial Foundation. Please join us in supporting this not-for-profit organization dedicated to honoring the lives of our fallen heroes. The Foundation provides support and assistance to the families of Chicago police officers who are killed or catastrophically injured in the line of duty. In celebration of July 4th, we wanted to share all of the parties, brunches and celebrations from across Rockit Ranch's award-winning concepts. Check out some of our events below! Rockit Bar & Grill and Rockit Burger Bar are both open for Chicago's favorite brunch on Friday, July 4th. Doors open at 10am in River North and 10:30am in Wrigley. Start your holiday off right with our full brunch menu, bloody mary bars and custom mimosa kits! Rockit Bar & Grill is opening the lounge at 5pm for a live concert from Ghosthouse, who UR Chicago said "is gonna give Chromeo a run for their money". You don't have to work the next day so you have no excuses. Join us for $15 Bud/Bud Light and $8 22oz Green Line drafts on Thursday, July 3. Join us from July 3 - 6th at Rockit Burger Bar (4700 N Clark) for Hot Dog Takeover, where we are serving up six gourmet, footlong dogs, each inspired by one of our award-winning burgers. Wash them down with our freshly tapped Crunkle Sam beer from Clown Shoes Brewing. They only produced 8 kegs and we got 4 of them! Nothing is more patriotic than a 56oz margarita. Celebrate Independence Day the right way at Loco Libre. Doors open at 5pm, DJ starts at 9pm and we are serving up the Loco-rita at only $35 (normally $50). The patio is open...Let's get loco! Sheridan Road Magazine declared that they "can't recommend brunch enough" in their recent review, and on Saturday July 5 we are celebrating the holiday weekend with our All American items and a complimentary sample* or special $4 glass of Temperance Beer Co's Freedive. Try the Housemade Donuts and Old Fashioned Jam, Cast Iron French Toast, or "Spam" Benedict, then wash it down with our innovative "Improved Mimosa" or a bloody mary. *One per person. Sample is 1 ounce. 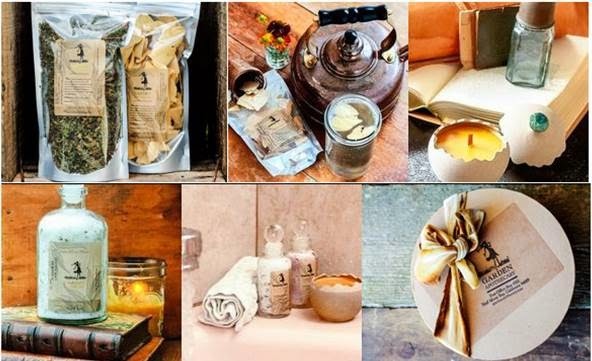 Check out these amazing products from Garden Apothecary designed to relax and renew you from the inside out! to see more about what they have to offer! Founder, Jennifer Lee Segale, has a back ground in professional botany. She started farming on the California coast in 1999 and started a landscape design company based in the San Francisco Bay Area. 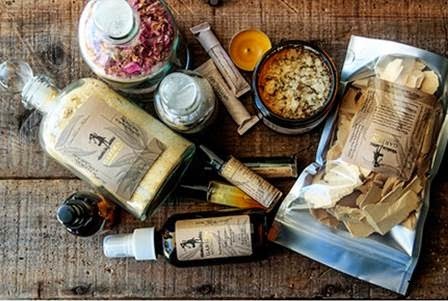 In addition to her company Garden Apothecary, she does plant research for her product line in Central America. Jennifer’s plant research mostly focuses on healing botanicals that are incorporated into the product line. Rose Leaf Bath Tea - rose hips oils, pink rose powder, petals and Epsom salts are perfect for an indulgent hot soak. Packaged in a lovely recycled glass bottle and top; after use the bottle can be used to hold precious items or used as a decorative vase! Citrus Peel Bath Tea: the organic tangerine, bitter orange peel and lemon scent is subtle and great for the skin and hydrating. A perfect gift for the fitness loving girl. Epsom salts are great to soak in after tiring out muscles. The Nordstrom Anniversary Sale starts July 18th! Their biggest nationwide sale event of the year, the Nordstrom Anniversary Sale, runs from July 18th-August 3rd! The Anniversary Sale isn’t a clearance sale, though – it’s a unique opportunity to shop brand new merchandise at amazing prices (and to stock up on fall must-haves before the season even starts). This year customers will get the chance to shop brands like rag & bone, Rebecca Minkoff, Vince, Frye, Diane von Furstenberg, Hugo Boss, The Honest Company, Alexis Bittar, J Brand, Tumi, Michael Kors and more. Prices only last for two weeks, and all Anniversary Sale merchandise will return to full price on August 4th. 7 Days Left to IPA Submission Deadline! 7 DAYS LEFT TO SUBMIT! Submit your work to the world's most prestigious photography competition: The International Photography Awards. Over $175,000.00 in cash prizes have been awarded to date. RayKo's spring resident artists are prepared to unveil their work after 6 intensive months! They are pursuing everything from cliché verre prints and sublime chromogenic prints to building giant site-specific cameras that a grown man can fit inside (because that man also happens to be a human shutter). This exhibition features new work by Carlos Chavarria, Adam Donnelly & David Janesko, Ron Moultrie Saunders, and Wenxin Zhang. Come meet these talented and innovative artists on the opening night of June 25th between 6-8pm! Send us your best! Judy Walgren of the San Francisco Chronicle and I are looking forward to seeing where and what you've explored! Copyright Rayko Photo Center © 2014, All rights reserved.